Fatherhood, feminism and cultural beliefs brutally clash and intertwine in Abhishek Majumdar’s fiery Pah-La at the Royal Court. Based on real stories of the Tibetan unrest of 2008, Pah-La discusses the causes of the tension, the bitterness of the retribution and the unyielding power of religious and political power structures. 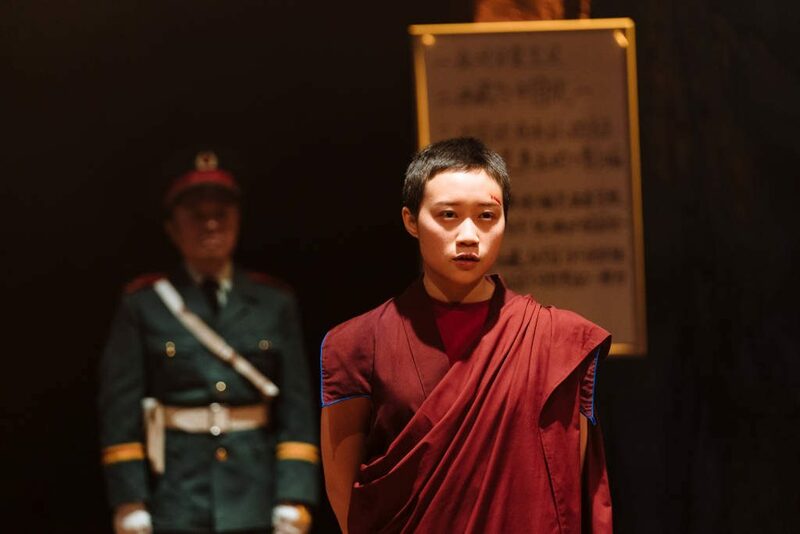 Tibetan nun, Deshar (Millicent Wong) has a boldly resistant view of how things should be. Not one to be pushed around by the Chinese authorities, Deshar performs the ultimate political protest of self-immolation to make her voice heard. In doing so, she sparks a mountainous chorus of violent debate that is felt all across China. Wong carries the intensity of this script with composure and maturity. The pain of Deshar’s self-sacrifice is unimaginably weighty and takes an exhaustive toll on Wong’s physical body- but she never drops that suffering, not for one second. It’s hard to believe that this breath taking actor is making her UK stage debut. Movement direction from Quang Kien Van comes into its own most spectacularly during scene six where the nuns of the monastery are forced into learning the five major pillars of re-education. Their voices cry as their bodies collapse in prayer, more from exhaustion than benediction. But the relentless government official Deng (Daniel York Loh) will stop at nothing, torture is merely a game for him. It seems that Majumdar takes the craft of playwriting and adds an extra dose of adrenaline for good measure. This compliments well to Debbie Hannan’s direction which is precise and measured but with flares of rage that suddenly scorch, emphasising the rising heat of the political unrest. It’s a heavy piece, certainly not one for the faint-hearted or for those who easily suffer from hot flushes- a roaring pyrotechnic scene frames the closing of act one magnificently.